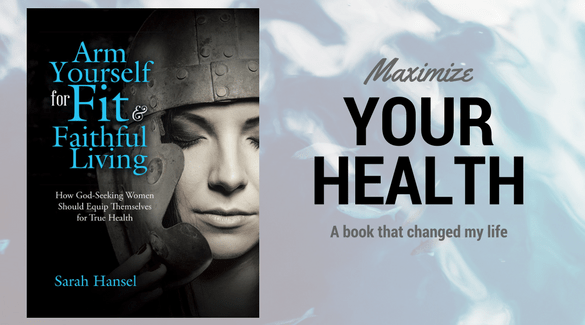 Ladies, this Christ-centered wellness book was written for you. This book has meal plans, recipes, and a slew of workout plans, but the true reason for this book is not to engage in another diet or workout. This book goes deep to identify and fix the culprits that are behind the true assaults on our bodies. s to compete, size up, and to try and outdo the other women and families in our life. This “I” is controlling things that we didn’t know possible. It could be the very thing straining our health and making it more difficult to enjoy life to the fullest. I travel and work with a lot of women and one area many fall short in is comparisons. We can easily become jealous and get our undies all bunchy because life’s not fair. We’ve been taught from a young age to compete and win and be better than everyone else in our sports, music, writing, grades, extracurricular activities, and even be, or look, more spiritual. The sad part is we are raising children in this same atmosphere. We can’t afford to keep living like we are and expect to have a healthy mindset as we age. We can’t just decide to turn off the bad thoughts, depression, and mental garbage when we want to. If there was a plan to end all health woes, like sitting in a dark warm quiet room, performing deep stretching, surrounded by diffused essential oils, with soothing music (this does sound heavenly doesn’t it? ), wouldn’t these facilities be filled? This stress relieving approach does work, but not at the root. We can meditate in a beautiful ambiance, but it’s only for coping with the issues. The fact is, there are a few ways to combat the root of our health issues, but it’s going to make us face some nasty habits, personal hangups, and possibly expose areas of our heart that we purposely suffocated…for many reasons, we might not want to talk about. No one wants to be vulnerable, humble, or expose things buried in our hearts. However, God’s way has us doing just this sometimes. Getting real with our issues gives us real results. For example; forgiveness can solve so many physical health issues. When I was bitter towards a close friend, I ate way more than I should, I slept a lot less, and was in a constant state of negative thoughts. I was a wreck inside and out. When I took steps towards honest forgiveness, I was able to have love in my heart again. Compassion swelled and I was free. My health improved and I enjoyed so much more of my days and thoughts. I could have written a book about personal training and eating right. But we’ve read them, tried those diets, forged through calorie restrictions, and worked out with all gusto – to little avail without truly getting to the root. This book talks about our entire being – whole wellness. It discusses those deeper issues, that silently sabotages our health from the inside out. The issues that we know we need to address, but might be a little uncomfortable to do so. It addresses the lies we’ve listened to and believed. Does the Bible Really Have Health Answers? When I was on my journey to true health, I knew the Bible held answers, but I was looking in the wrong place. I was looking for healthy eating, or ways to exercise better. I wasn’t looking at God’s plan for dealing with root issues for me. I knew the Scriptures would help if I memorized and repeated, and believed them when I was in doubt. I also knew I could pray and ask for guidance to help in my battles. But, when I wrapped my mind and heart around the truths found in it, is when I saw my boulders roll out of the way. Spiritual tools are needed to fight and prevail, and we must do it God’s way (in and through Christ). If you have health hang-ups that just won’t let up, the Bible has answers for you. It has THE tools (God’s Armor) you need to fight and take your stand – discussed in this book study. If you have health hang-ups that just won’t let up, the Bible has answers for you. It has THE tools (God’s Armor) you need to fight and take your stand. This is the message in this book study. This study focuses on you, your relationship with God, and each other. It opens up by taking you through a personal quiz about your health; nutritional, physical, emotional, social, spiritual, and mental. This is the wellness identification part. It will show you which health area you personally struggle with most (health doesn’t necessarily mean your physical strength and wellbeing or your nutritional expertise). This directs your path to identify those deeper issues in the heart and spirit or mind and soul that could be hindering your health physically. Due to the more intense nature of exposing the root of health issues, this study is to be journey alongside a friend (accountability partner). Going to war or in a battle with a friend is much safer than going in alone. The spiritual battle is affecting our health. And one thing we can’t do is fight in this war with physical means. We can’t try harder or be nicer (although those things do help) to win our health battles any more than we can swing an iron sword and wound a ghost. We are in a spiritual battle and it’s affecting our health. And one thing we can’t do is fight in this war with physical means. We can’t try harder or be nicer (although those things do help) to win our health battles any more than we can swing an iron sword and wound a ghost. Spiritual tools are necessary to fight and prevail, and we must do it God’s way (in and through Christ). If you have health hang-ups that just won’t let up, the Bible has answers for you. For me, instead of being jealous of others who looked better in their skinny jeans, I learned to listen to God. My heart was soon filled with love and acceptance, rather than jealousy and fear. When I was bitter towards someone, God showed me how to have compassion fill my heart and gave me a burden to pray for my relationship. You Hear The Holy Spirit, But Do You Listen? Hearing and listening are two different things. I can hear my kids talking in the background, but I’m not listening when I’m also on my phone texting. I know I have the Holy Spirit inside (Christ promised – Eph. 1:13-14) and I know He speaks to me and directs me (after countless trials, I’ve learned to listen and obey when He calls as much as possible). I was impressed to write a whole-health journey on how to fight our battles God’s way, and not our own. If you are ready to take the challenge and change your perspective about your health, I’m more excited than ever for you. Join me and the other women who are learning to stand strong in the faith, with God’s tools, wisdom, and armor to combat the fiery darts that come gainst our health. Join me and the other women who are learning to stand strong in the faith, with God’s tools, wisdom, and armor to combat the fiery darts that come gainst our health. I can’t wait to hear your story! Reach out to me if you want me to pray for you, connect you, or just to even say hello!